Milos is the fifth biggest island of the Cyclades island complex in the south-western part of the Aegean Sea. The island is 86 nautical miles away from Piraeus and during the summer months, the transport is frequently. Its highest peak, Profitis Ilias, is about 751 meters above the sea level. 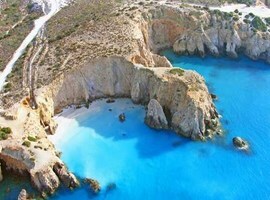 Milos is a volcanic island which is reasonably hilly, with relatively low mountains and with low vegetation. 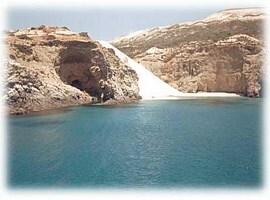 The flora and fauna of Milos are quite rich with many rare species which are protected by the Natura 2000. The permanent residents of Milos are approximately 5000. Adamantas is the central port, above which the island’s capital –Plaka– is located, circled in turn by the villages of Triovasalos, Pera Triovasalos and Trypiti. Another important township is Pollonia, a seaside village and linking port to the island of Kimolos. Other settlements are Zefyria, the old capital of the island built inland to be protected from pirates, and the coastal ones of picturesque Mantrakia, beautiful Fyropotamos and Klima, the “little Venice” of Milos. With more than 75 beaches, beautiful Cycladic style villages, and monuments which witness the history from the ancient years until the recent days, a visitor can easily fill at least 10 days of exciting holidays in Milos. Milos also is a much beloved destination for couples in love as the volcanic landscape creates a unique, special and of course romantic atmosphere. In the church of the Holy Trinity where you can find the rare type of the cross-shaped basilica, samples of the local religious tradition; images from the 14th century Cretan works of the renowned painters Emmanuel and Antonios Skordilis, epitaphs and carved wooden desks, shrines of the 17th century, golden oblations and, of course, the bishop’s throne and the temple. In a distinguishable neoclassical building, it’s housed the prehistoric collection of Fylakopi; painted potteries, idols, findings from the ancient town of Klima, a collection of ancient inscriptions, and sculpture samples of the Hellenistic and Roman period. The museum is housed in a building behind the church of Panagia Korfiatissa and offers a representation of an urban Milean household of the 19th century, with the loom, the kitchen, the bedroom and its cellar, presenting the furniture, embroideries, costumes of the era, decorative and everyday things and old pictures. The mining museum in two levels presents the impressive geological particularity and mining history of the island through tools, objects, pictures, samples of minerals (with information about the process and the use of the materials), and audio-visual material. After request, the guides organize geological excursions in Aggeria, Alikes, the old capital Zefyria and to the volcano in the area of Kalamos. Unique in size in the entire Greek territory, the old Christian catacombs are close to the village of Tripiti, in caves of 70m above the sea level. The complex is separated in 3 large underground stoas (but only the two can be visited), carved on the porous volcanic rock and was created possibly from the 150-200AC. The total length is 185 metres and until today are saved 126 carved, arched graves. The ancient Roman Theatre was originally constructed by the residents of the ancient city of Klima, probably during the Hellenistic Age (in 3rd century BC). In the theatre seven marble tiers are preserved, six rows of seats, the auditorium, the orchestra, the stage floor and a lot of architecturally elaborate parts. The excavation project began in 1989, and the order for the theatre’s first cleaning was given by Ludwig II. Built on a prominent area, on the hillside, the theatre has a breath-taking view to the port, and its acoustics are extremely good. So, quite often theatrical performances and music happenings take place there, as in its present shape the theatre has a seating capacity of 700 people. 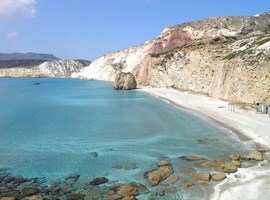 Milos is famous for its beautiful and lacy beaches. 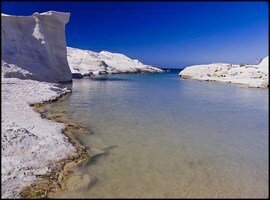 Crystal blue waters, white sand, ad colourful rocks are only a few of the characteristics of the Milos beaches. 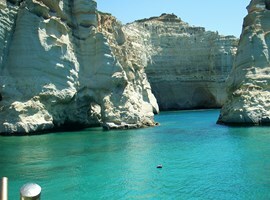 Thanks to its volcanic ground, Milos has an impressive variety of beaches. The visitor can meet a wide range of colours and depths while someone can swim in fully organized beached or choosing more lonely and wild. The road network is pretty good to access the beaches on the northern side of the island and the most of the southern. The beaches on the eastern and western side are a little bit difficult to access as the plenty of the route is back road. Beaches like Kleftiko, Gerakas, Sykia and many others can be visited only by sea (from the area of Adamantas start sea day trips to these difficult accessible beaches). Indicatively, below are presented some of the most beautiful beaches of the island. It is the biggest beach of the island with white sand and deep blue waters. In the area works an organized camping and the beach is frequently accessible by bus. The beach is separated in two parts; the one is more quiet while the other is organized and has restaurants, beach bar and offers watersport activities like surfing and kite-surfing. It is quite a big beach, ideal for families with children as the waters are shallow. The beach has been awarded with the blue flag by the European Union since 1993. There work a restaurant, a volley court and there are a lot of sunbeds and umbrellas. Other beaches on the gulf are the Empourios, Lagkada and Fatourena. Next to the ancient area of Fylakopi, the caves with the vertical light-coloured rocks create a landscape of unique beauty which is ideal for swimming. A semi-organized beach, ideal for families and couples who want to spend some relaxing moments. Very clear waters and golden sand make the place really beloved by the visitors. 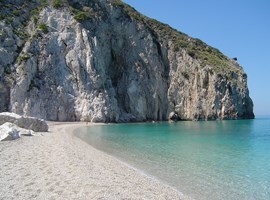 Other beaches in the north side are the Alogomandra, Kapros, and Sarakiniko. It is a beach accessible only by sea; however is one of the best in Greece! It’s full of caves and seaways. It’s one of the most popular beaches of the island, organized with umbrellas and sunbeds, and a beach bar. An exciting moment is when the sun starts to sink in the sea, creating amazing colours. An easily accessible beach by car and by the local transport, so quite popular. It’s separated in 3 parts; the central and organized with restaurants, taverns and beach bars, the most distant part where is a nudist point and finally, the part where flow warm waters. Other beaches on the south side are the Gerakas, Gerontas, Provatas, Tsingrado, and Fyriplaka. During the summer months, boats start from the port of Adamantas for the tour of the island. The boats stop in popular beaches as well as in the next island of Kimolos. Alternatively, they exist tour with small vessels which cover fewer time routes, stopping for more time in the place which is like an exotic card-postal, Kleftiko. 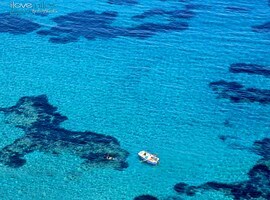 If you rent a vessel with your company, you can swim in the crystal blue waters of the little uninhabited island of Poliegos. In Milos there are a lot of small family hotel complexes offering a great service and hospitality, and a comfortable and friendly atmosphere. Also, in the most of the villages, there are good quality rooms and apartments to let. The island of Milos is a classic Cycladic island, with a unique, wild and mysterious landscape thanks to its volcanic birth. Romantic, relaxing, both popular and quiet, it offers unforgettable experiences and moments to its visitors. Although its size, someone can spend exciting time swimming in the clear blue sea, visiting ancient and culture treasures, having fun in the popular spots and relaxing while viewing the incredible colours of the sunset. The so-called island of the Olympian goddess Aphrodite, worth to visit it and explore it.